Last month, an engine fire disabled the cruise ship Carnival Triumph in the Gulf of Mexico. Almost no electricity, only one working elevator, and worst of all, a handful of working toilets for 4000+ people. Crew members handed out bio-hazard bags to set inside trash cans as ad hoc commodes, then collected them from hallways. Suddenly, the luxury vacation turned into a nightmare for a lot of people, especially those on the lowest floors and those in inside cabins. No one had any control over their circumstances. They only had control over their attitudes. Some screeched their rage at Carnival, threatening that they would “own” the company after their lawsuits were filed. Others, with grace, remarked that they had a three-day wonderful cruise followed by a four-day camping trip. Some passengers set up a “tent city” on the pool deck, moving their mattresses and bedding to an outdoor location away from the growing stench of human waste. Others left their hopelessly dark cabins to set up their new digs in the now-worthless elevator lobbies. No one was seriously hurt and everyone made it back safely to the U.S. (the huge ship was towed to Mobile, Alabama). Now, I am a self-professed “cruise queen.” It’s my favorite kind of vacation, and I’ve been on that ship twice. If I’d been on that cruise, I would have been one of the people most affected by the loss of power, since the handicap accessible room cabins are on a lower floor, and the ship is too big for me to navigate without a scooter—which is useless when the batteries run down and you can’t recharge them, not to mention the elevator problem. So I thought about how choosing one’s attitude makes all the difference in any situation. A lot. One of my most vivid memories showed me how true this is. Before my mother died, I went to Las Vegas with her and my sister for a family wedding. My sister Julie and I decided we wanted to go on the roller coaster at New York, New York. To our surprise, Mom indicated she wanted to go too. 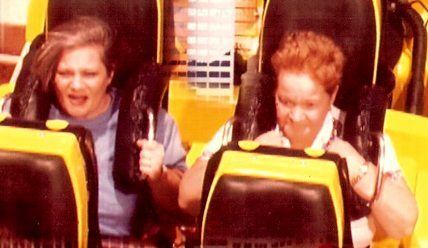 I had never seen our mom as a roller coaster kind of person . . .! I sat next to her, with Julie in front of us. It was fine when the lap bar was locked in place, but she looked at me quizzically when the workers secured us in heavy-duty shoulder harnesses. Mom did not have a good time. Every time I looked at her, she had her lips tightly pursed and her eyes narrowed. Julie and I were whooping and hollering with fun, and Mom was miserable. Mom was experiencing the exact same thing we were, but she had a very different attitude about it. They take your picture while you’re on rides like this, and I asked playfully, “Mom, you want our picture as a souvenir of our trip?” She growled, “NO!” And I laughed. . . and bought it.